It’s hard to argue with a classic. 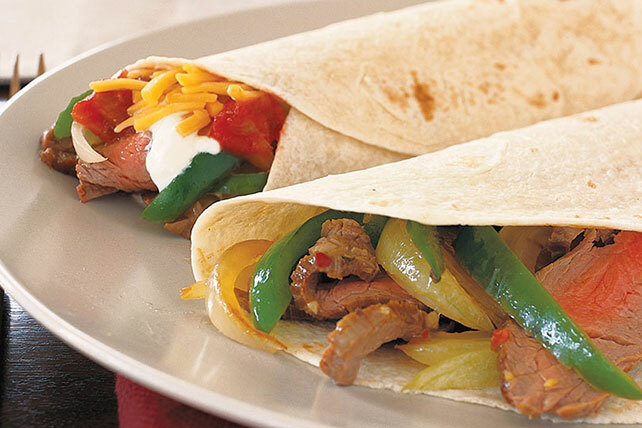 Marinated beef sirloin paired with tender peppers and onions makes a sensational, tortilla-wrapped Tex-Mex meal. Combine steak and 1/4 cup of the dressing in glass bowl; cover. Refrigerate 1 to 2 hours to marinate, stirring occasionally. Remove steak; discard marinade. Cook steak in remaining 1/4 cup dressing in large skillet on medium-high heat in 5 to 6 min. or until no longer pink. Remove steak; keep warm. Add peppers and onion; cook until tender. Add steak; cook until heated through. Serve in warm tortillas topped with cheese, sour cream and salsa. Reduce dressing to 1/4 cup. Substitute 3 pkg. (6 oz. each) OSCAR MAYER Deli Fresh Grilled Chicken Breast Strips for the sliced steak. Do not marinate. Cook chicken breast strips in the 1/4 cup dressing with the peppers and onions; spoon over tortillas. Continue as directed.